The US would be at risk and North Korea would be “cheering” if Washington were to negotiate a nuclear ban treaty, US ambassador to the UN Nikki Haley said, explaining why the her government was boycotting the talks. Several countries – including the US, France and UK, who are nuclear powers – announced Monday that they were boycotting the Nuclear Weapons Convention. Forty countries will be negotiating language for a treaty to outlaw nuclear weapons, in talks headed by Austria and Mexico. A tug-of-war is expected between nuclear powers and non-nuclear countries. “Suddenly now, the General Assembly wants to have a hearing to ban nuclear weapons. As a mom, as a daughter, there is nothing I want more for my family then a world with no nuclear weapons but we have to realistic. Is there anyone that believes that North Korea would agree to a ban on nuclear weapons?” Haley told reporters at the UN on Monday. At a UN General Assembly meeting in December last year, it was decided that the conference would be held in two parts. The first round of talks, March 27 to 31, is expected to focus on the purpose, content and format of the treaty, led by Austria and Mexico underlining the “inhumane nature of nuclear weapons.” The plan is for a treaty to ban nuclear weapons under international law and create a global norm that the use of nuclear weapons is a crime. Questions likely to be examined are whether the treaty would include only the prohibition of nuclear arms, or should be extended to include their possession, development, production and transfer. Some observers think the treaty draft will be compiled during the second round of talks, scheduled for June 15 through July 7, and may even be put to a vote. Critics of the proposal say such a treaty would not make the world safer. US national Security Council senior director Christopher Ford said during a March 21 speech that the treaty wouldn’t reduce the world’s stockpiles by “even a single warhead, as it cannot hold nuclear powers and their allies that are not participating in the treaty legally liable,”according to Japan’s Mainichi Shimbun. 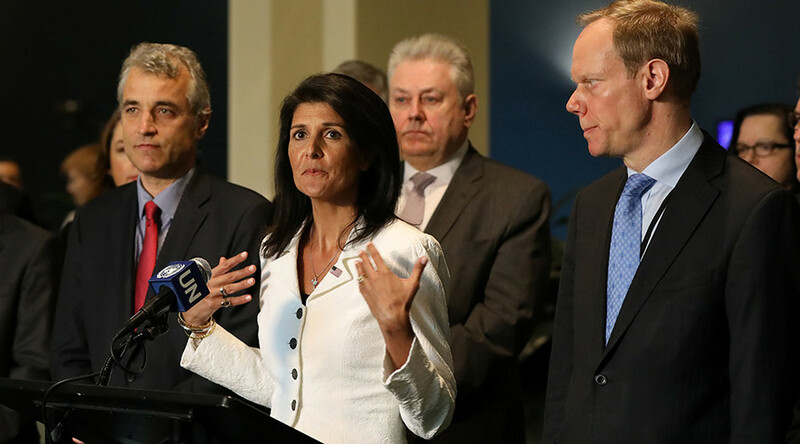 “The US has reduced its weapons by 85 percent,” said Haley, flanked by French and British ambassadors to the UN, who she said had already reduced their own nuclear stockpiles by half in keeping with the existing nuclear Non-proliferation Treaty (NPT). US, UK, France, Russia and China are the five nuclear powers with permanent seats on the UN Security Council. About 90 percent of the global nuclear stockpile is in the hands of the US and Russia. US President Donald Trump has tweeted the US must “greatly strengthen and expand” its nuclear capability until such weapons were outlawed.